The Slow Regard of Silent Things is a brief, bittersweet glimpse of Auri’s life, a small adventure all her own. At once joyous and haunting, this story offers a chance to see the world through Auri’s eyes. And it gives the reader a chance to learn things that only Auri knows (goodreads.com). 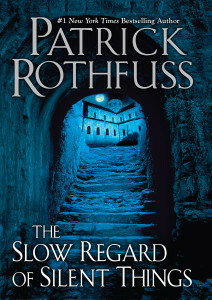 I was so excited when I found out that Rothfuss was writing a book based on Auri! I couldn’t wait to read it. Once I got The Slow Regard of Silent Things and started reading it I was a bit disappointed. This wasn’t what I was really hoping for. I wanted to know about Auri’s background and not her strange day-to-day activities, which is what this book describes. I now understand more of how she thinks, but other than that I know nothing more about her. By reading this you realize that Auri isn’t quite right; maybe broken. She treats all inanimate objects around her as a person. She gives them names, a special place, and even feelings. Kind of makes you wonder even more who she really is or was. I hope I get to find out in the next novel. This is a very strange book and I have never read anything like it. I was surprised I was able to get through it because reading about the little things in a person’s life isn’t all that interesting. If it was any longer I don’t think I would have finished it. Even though the story wasn’t what I expected I still thought it was a beautiful book with spectacularly placed illustrations. Some would wrap around the words and others would be a border for the page or take up an entire page. They would be pictures of places she was in or objects she found, etc. I just love how pretty the book is. The other thing I enjoyed was how well the book was written. Even though it was a bit strange, it was still written beautifully. Rothfuss gives us a good picture of the Underthing and what it is like for Auri to live there. I felt like I was there with her traveling through the mass of dark, confusing tunnels. If you want to get this book because you expect it to tell you more about Auri like who she is, where she is from, etc., then you will be severely disappointed. Don’t buy it. Also, if you haven’t read the other books in the Kingkiller Chronicles, then don’t buy this book. If you want to know how Auri’s brain works and don’t mind a book without much of a plot, then this book may be for you. It is quite different from anything I have ever read; I was glad for the experience, but I don’t think I would read it again. It was utterly confusing, mostly non-sensical but also beautiful and beautifully written. Also Auri is amazing. I cant wait for the third Kingkiller book though. And I absolutely adore Auri. I am dying to read the next one! It better come out soon! I knew there was a reason I prefer to read finished series…. I actually love this book and how its kinda like Lynn says, genre marmite. This definitely seems to be a marmite type of book. I enjoyed it – but that’s because I was forewarned of what to expect and I just love PR’s style of writing. But, yeah, if you’re expecting any revelations or moving forward in the plot – well, prepare to be disappointed! I was disappointed because I wanted to know more about the character. You know, how she ended up where she is, etc. That would have been really neat!